Babs Young writes: I’m not sure what this robin is telling the little ones, but it sounds important. He’s probably hollering “Look out, here comes that cat again!” Or maybe “Where the heck are all the cherries??? ?” Good to see that Mama Nature is busy replenishing the supply of robins. Apparently she’s decided to give us another chance. In my ceaseless efforts to provide sound information, I looked up the proper name for the American Robin in my Birds of Michigan Field Guide. I was astonished to discover that it is Turdus migratorius. Now I ask you, is that something you want to teach the school children? I can hear whole classrooms collapsing in giggles. I wonder if the Legislature knows that it has saddled us with a State Bird most properly called Turdus migratorius. *I am going out on a limb here. My beloved Stan Tekiela says that male robins are distinguished by their “nearly black head and tail.” Read Torch Lake Views and learn something new every day, some of it even true. Go out on a limb! Don’t sit on the fence! Good morning, Gerry. I have been poring over pages of confusing warblers and now think that one of the birds I spotted last night in the popple grove might have been a female oriole. I’d like that. Warblers are too much for me. Robins, bluebirds, woodpeckers, hummingbirds–those I can handle. Well, not with my hands…. Never mind the school children. When a little group over on Weather Underground made the discovery about the name a couple of years ago, there was much giggling there, too. We finally figured out that the Latin turdus means thrush, which is the robin’s family. That still leaves a couple of interesting etymological questions, but we’ll leave those for another day and just enjoy the birdies! I do love the robins. I’ve got a youtube video that provides several minutes of their singing. I listen to it now and then, when mockingbirds just aren’t enough. The thrush is called Turdus Turdus. That’s twice as tough to bear for them. Oh, dear lord – that caught me right on the funny bone. We used to have a manager known as “Turdus Ignoramus” seeing as he was such an ignorant … you get the drift. Turns out we were calling him a thrush, which are rather nice, cheery wee birds who don’t deserve to be associated with such people as he. I’ll have to go to youtube and search for birdy videos, if only to drive the cat nuts! Great capture by Babs! The true name of the robin is definitely giggle-worthy; I will stick with “robin”, thank you very much! I have a slightly older robin “baby” I’ve seen pestering its parent and following it all over my back yard. Unable to catch a photo so far. The things I do learn here! I wonder how I can get this into a sentence at work tomorrow…. 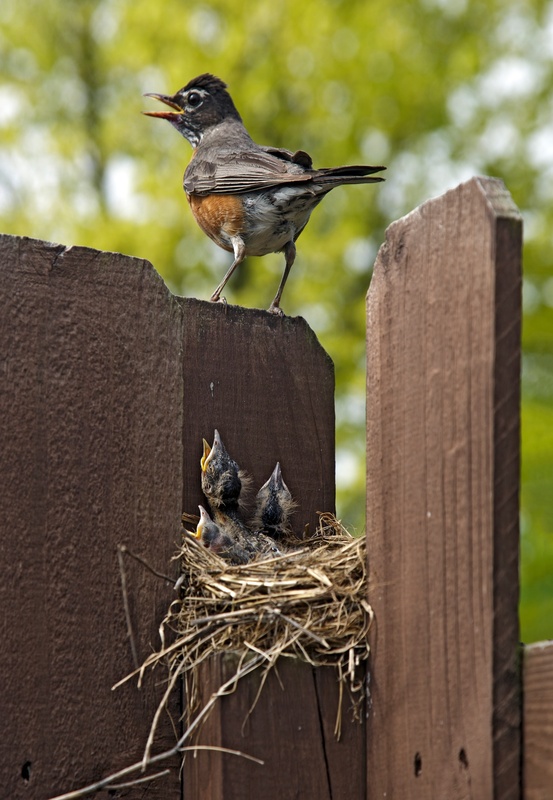 There are just 3 babies in that nest – which is at the low end of the average number laid by robins. I wonder if she started out with more. Thanks to both you and Babs for such a wonderful close-up view. Makes me glad my parents didn’t give me the Latin version..